Gmail is Google's web-based email service famed for its stars (favorites), labels (tags), and anti-spam capabilities. It's accessible on the Mac through any modern browser, including Safari and Chrome. While the mobile version of Gmail is also available via Safari on iPhone and iPad, Google provides a native, universal iOS app as well. 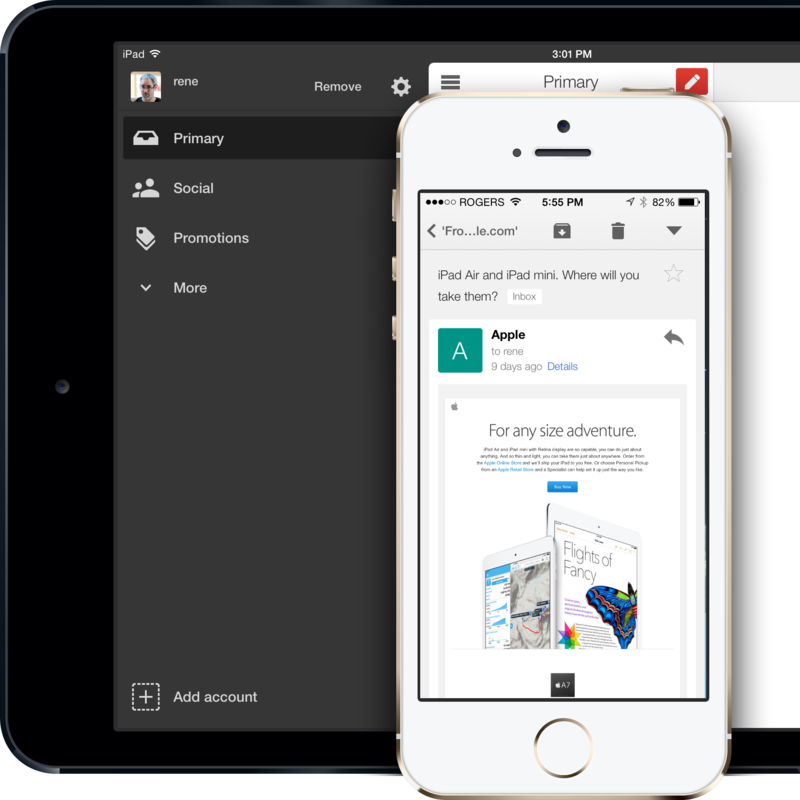 Gmail for iPhone and iPad provides support for up to 5 accounts, push notifications, and more. Folks who use Google Apps can sign into the Gmail app just like they would do on the web. The search feature in the Gmail app is not only fast, but offers predictive text so it can guess what you're looking for before you're even done typing your query. Some people may argue that while the Gmail app is well designed, it wastes a lot of space due to it laying emails out in a chat-like format. Either way, since the Gmail app was designed around the Gmail service itself, it's a great option for anyone that only uses Gmail. If you use other Google apps for iOS, many of them can even work seamlessly with the Gmail app just like they do Chrome and Google+. For anyone who has multiple accounts with multiple email services, the Gmail app obviously can't tie them in and may not be the best solution. For example, if you've got an iCloud email address and a Gmail address, the Gmail app for iPhone and iPad probably does make the most sense. For that, the built-in Mail app or a third party app like Mailbox would be a better option. The Gmail app is available for free for both iPhone and iPad. Gmail for the web is getting a new design! If you've ever considered switching to Gmail for your email needs, here's everything you need to know! Gmail and Google Calendar iOS updates bring new features! The Gmail and Google Calendar apps for iPhone weren't that great before. Google's hoping a complete Gmail overhaul and some new Calendar features will change all that. A data breach has reportedly seen the theft of the login credentials for millions of email accounts, including Gmail. Yahoo has announced support for Gmail within its Mail app, allowing you to use your Gmail account from within Yahoo Mail.